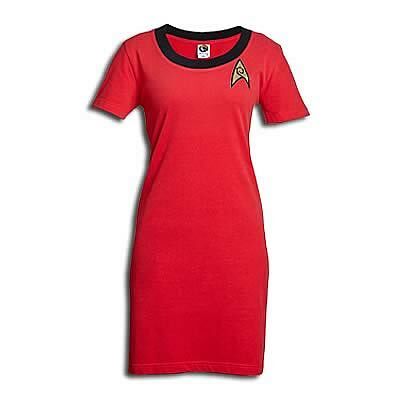 Shopping for Star Trek Apparel? As an officer in Starfleet, you need to dress the part! Female Engineering Officer Dress based on Star Trek: The Original Series. 100% cotton dress based on the Star Trek universe! Developed exclusively for Roddenberry, this fashion T-shirt dress features the USS Enterprise division color and insignia made famous by Uhura in Star Trek: The Original Series. Constructed of 100% ultra-soft cotton, this is the perfect casual uniform! Available in sizes XS, S, M, L, XL, and XXL, it's machine washable and dryable, too. Order yours today! The custom-made insignias are not screen printed, nor are they patches. Instead, an innovative method is used that utilizes flex material (also called apparel film) and flock. The gold areas of the insignias are flex and feature a metallic look. The black portions of the insignias are made from flock, a velvet-like material with a 3-D look and feel. The gold flex and black flock are individually placed components that are precisely cut on a vinyl cutter, and then applied with a professional heat press (not a hand iron) using very high temperatures and pressures. These graphics will actually outlast the shirts that they are "printed" on. Best of all, this dress is 100% machine washable and dryable!